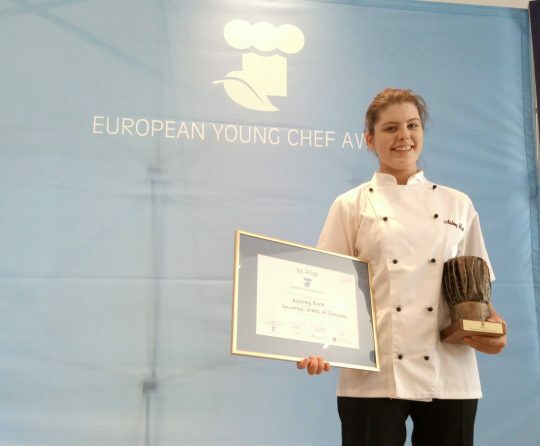 Aisling Rock from Galway-West of Ireland, European Region of Gastronomy 2018 is the winner of the European Young Chef Award 2017, who surprised the jury presenting her innovative dish: Mackerel, Pickle, Sheep Yoghurt. The innovative version, based on the traditional recipe Salted mackerel with root vegetables and potatoes, impressed the jury not only for the outstanding flavours. The dish was awarded because it conveyed fidelity and respect to tradition. Aisling was able to valorise local, fresh products from her region, as well as to show the link between the traditional and innovative recipes thanks to her storytelling.